Theres a place just off the coast of Edisto Beach where the world stands still. There are no homes, no roads  nothing exists except nature as Mother Earth intended. This place is Otter Island. The island is protected by the Department of Natural Resources and is a part of the St. Helena Sound Heritage Preserve/Wildlife Management Area so the nearly 2,000 acres will always be a place that remains untouched by the hustle and bustle of the world. Otter Island provides one of the few locations where marine life and other animals indigenous to the lowcountry can go to live their lives without interference from humans. For that reason, the island maintains one of the most active nesting areas for Loggerhead turtles. Its also home to the bald eagle and several other rare birds. Furry woodland creatures like deer and raccoons also call Otter Island home. Its surrounded by white sand beaches and brackish marshland. Its densely covered in a maritime forest and scrub brush. The natural landscape does have some trails carved out either from deer or other visitors, but for the most part it is just raw untouched nature. For all the natural beauty the island has to offer, its not all just for the animals to enjoy. Visiting the island is doable by watercraft. Motorized watercraft can anchor right off the shore of the island to spend the day exploring the island, fishing, crabbing, or swimming. 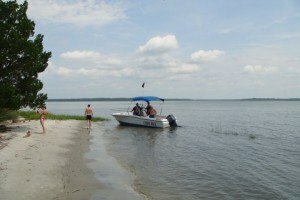 Kayakers can also paddle out to the island from the Edisto marina or any boat landing. Once on the island, visitors will find everything from sharks teeth to sand dollars to seashells to old artillery shells. If you want to fully explore the island, bring closed toed shoes to avoid sand spurs and insect repellant in the summer months. 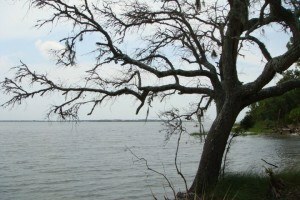 Its also a unique position to look over the water back towards Edisto Island and view the dolphins that make the waters of the area their home as they feed, play, and swim in the area. Camping on Otter Island is also permitted and really gives visitors a sense of living on a deserted island. The only sounds at night are the calls of the marsh birds, gentle waves lapping at the shore, and rustle of the palm fronds. Campers can build a campfire and relax on the beach under the starry sky. However, because Otter Island is protected, permits for camping must be obtained and are given out only from November to April. Contact McKenzie Field Station at (843) 844-8822 for permits. So the next time youre in the area, take a trip out to Otter Island to experience the untouched elements that make up the lowcountry. Otter Island is such a treasure and literally the happiest place on earth as far as I am concerned. Taking my children to OI to explore and witness the beauty of the earth as God intended is something I value more than anything and something I hope we will always be able to do and enjoy.